You know you’re doing things right when your child-self would be proud of your 22-year-old self. That’s how I felt on the first Saturday in May, walking across the roof of Churchill Downs racetrack and looking over the twin spires at the huge oval below. The grey sky, intermittently spitting sprinkles of rain, could do nothing to alter the mood. You could see it all from my vantage point, where I stood with two Derby media veteran friends. Masses of people swam their way through the rain – across the parking lots, through the gates and into the grandstand. Tarps shielded infield party-goers from the steadily increasing sprinkles. Women in curve-accentuating dresses and stilettos and men in suits looked over their VIP balconies. Far below, horses cantering to post for the second race were the size of ants, the jockeys like colorful specks perched on their backs. It reminded me of my first time attending the Kentucky Derby in 2013. Similar grey sky, same twin spires, different Annise. I was 17 and had skipped senior prom (partially because I did not have a date) to fly to Kentucky, prompted by the invite of a friend who was working for Hall of Fame trainer D. Wayne Lukas. Armed with a general admission ticket and my favorite Ruffian baseball cap, I knew little about horse racing aside from what I had picked up while ponying racehorses at the North Dakota Horse Park. My friend drove me onto the backside of Churchill Downs in her little pickup truck and flashed her racing license. Security waved her through and I was in. Much different from this year, when they meticulously asked to see every pass for parking and identification – which I prefer to ensure the safety of the thousands of racing fans crammed together in a relatively confining space. Because my friend was ponying Will Take Charge to the starting gate of the Derby, her family ventured into the crowded and soggy infield to try and see her. I avoided the infield, instead settling on a chair along the hedges outside the track kitchen. Even though I had to stand on the chair to see, it was better than almost any grandstand seat. I had a view of the entire backstretch and far turn. I stood on that chair for hours leading up to the race, unwilling to risk a seat vulture swooping in to steal it. 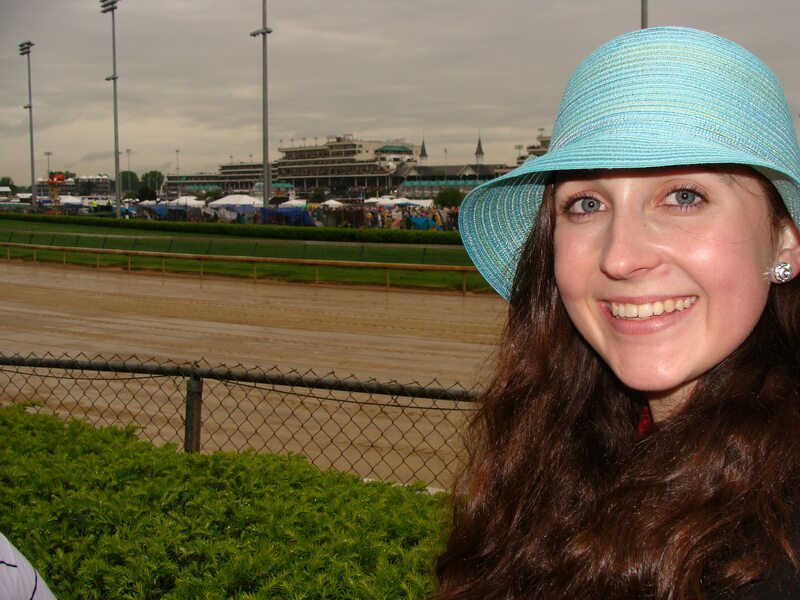 By the time the Derby horses paraded in front of me and I embarrassed my friend with my cheering, my hands were soaked and shaking from cold and adrenaline. I remember little about the race itself, except that I could not hear the announcer due to the wall of noise blocking his voice from reaching the backside. I stood there after the race wondering who the winner was. I later found out it was Orb, trained by another Hall of Famer, Shug McGaughey. This year I wore a media credential, authenticating my position on the Kentucky Derby Notes Team. I had a beautiful red lace dress, matching red fascinator that made me feel like Kate Middleton, and knowledge about what was going on and the horses who were running. Derby #2, five years later. As I looked at that view, I began to laugh. Joy and pride and disbelief flooded my stomach and gripped my chest. I looked over the edge at that view, and I could see all the way over to the track kitchen. And the laughter turned to tears. Not just little tears, but the kind of crying that makes you double over. Tears of thankfulness, appreciation, nostalgia and anticipation for the future. My friends cried with me and wrapped me in a hug, all of us grateful for the experiences that brought us to this point, surrounded by a sport we love. A sport that has given people hope and jobs and exuberance and despair, drug them through mud and lifted them onto pedestals. I felt grateful for my parents’ unfailing support, and the mentors who had faith in my potential and patience to educate me about what they have learned through years of experience. To the rest of the world, horse racing might seem like horses running around in circles. But to those of us who love and embody it, horse racing is a patchwork quilt of souls stitched together from all walks of life and corners of the world. The purest of these souls are the equine masterpieces shaped by God’s own hands with the help of man; athletic artistry fine-tuned over hundreds of years. 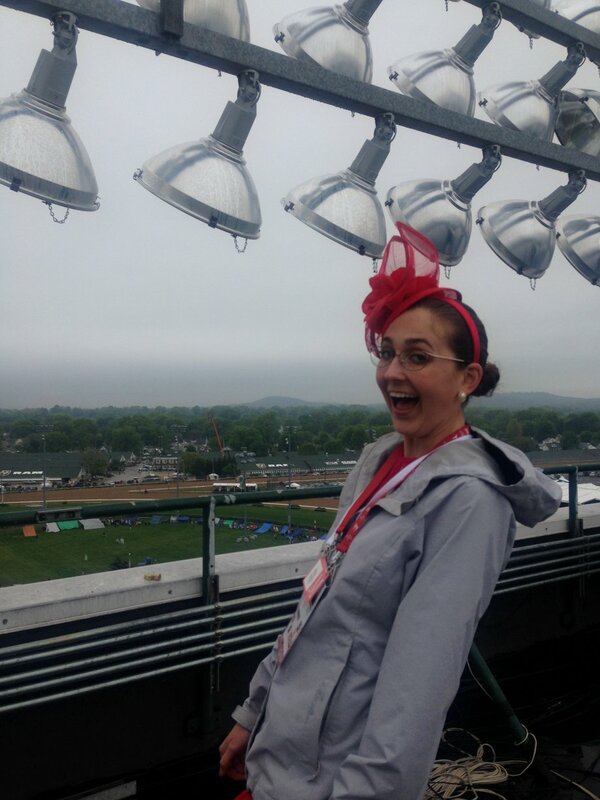 I did not fully realized all of this while standing on that chair outside the track kitchen, wet and chilled to the bone awaiting the running of Kentucky Derby 2013. That was only the beginning of my journey. But I did as I looked out over those twin spires on May 5, 2018. I sure have come a long way, and have much further to go. Today it was announced that I am one of 12 individuals worldwide accepted into the prestigious Godolphin Flying Start program. 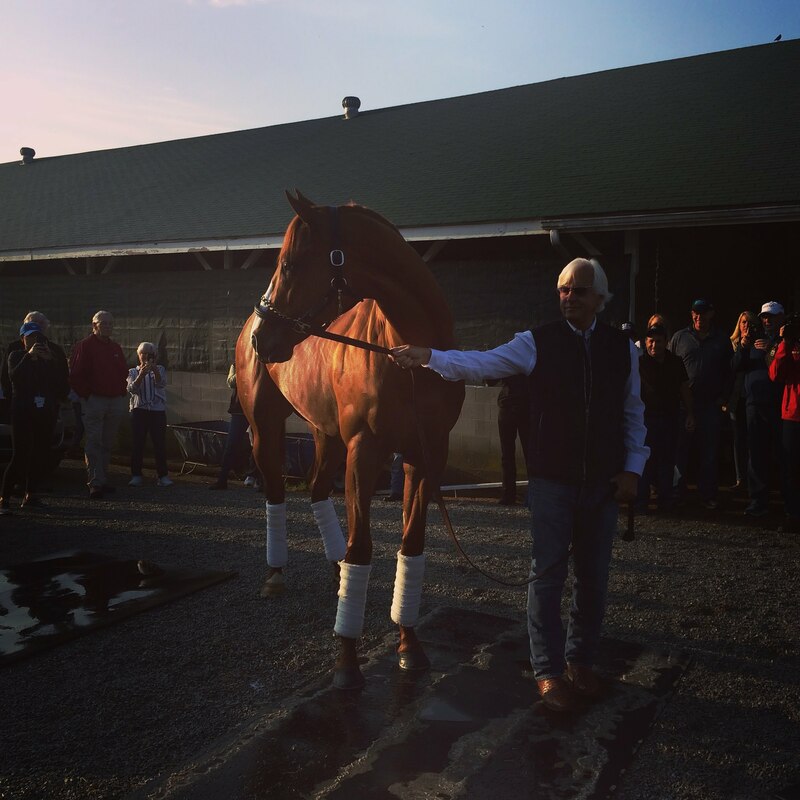 Saturday, Justify will attempt to become the 13th Triple Crown winner. For more great reading, click here for my friend Ben Gowans’ piece about his first Kentucky Derby experience!